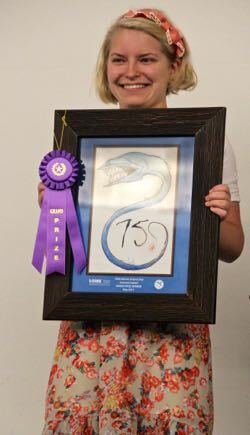 The Virginia Institute of Marine Science continued a yearlong celebration of its 75th anniversary on Saturday with its annual Marine Science Day open house. Susan Maples-Luellen, VIMS Director of Outreach, estimates that more than 3,000 people came out to enjoy a behind-the-scenes look at how VIMS scientists help manage blue crabs, restore oysters, survey fish populations, unravel food webs, and monitor water quality, among many other highlighted programs. This year’s event gave guests the special opportunity to learn more about the history of the scientists, educators, and students whose efforts help sustain and restore ocean waters and marine life. Established in 1940, VIMS conducts research in Chesapeake Bay and the coastal ocean to the benefit of people worldwide. “Marine Science Day offers us the opportunity to share our research, education, and advisory service activities with the local and regional community,” says VIMS Dean and Director John Wells. “This year was especially exciting because our guests not only learned about current research, but helped us celebrate our past as well.” One part of that celebration was a stamp cancellation offered by staff at the Gloucester Point Post Office that used a specially designed 75th anniversary postmark. During the daylong event, visitors enjoyed the opportunity to tour the VIMS teaching marsh, observe seagrasses and the animals they harbor, and go on self-guided tours of the riparian forest. Kids and parents also got a chance to collect and observe organisms from the York River. A Wacky Science Photo Booth allowed visitors to strike a pose in front of a green screen, with the historical background remaining a mystery until the photos are posted to the VIMS website next week. Photos taken at the photo booth will be available by Monday, June 8th. In addition to these daylong activities, guests also had the opportunity to partake in a series of events beginning at specific times. Keeping with the anniversary theme, Director of Communications David Malmquist gave a mini-lecture to visitors interested in learning more about VIMS’ past, present, and future. Assistant Professor Chris Hein used his tank-like drill rig to give multiple demonstrations of how sediment coring can aid in uncovering the past. During a seafood cooking demonstration by Chef Wade O’Neill of the Culinary Institute of Virginia, participants helped prepare coconut beer shrimp with a sweet and tangy dipping sauce. 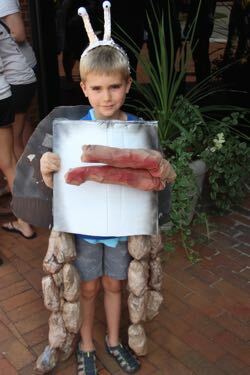 The always-popular Marine Life Costume Contest—in which children and adults from around Tidewater model their handmade creature costumes including a marine iguana, shark, dolphin, mangrove trees, and crabs—drew a large crowd. Van Hutchins won best overall in the contest with his fiddler crab costume, while Nicole Kogan won most original plant or animal with her personification of a yeti crab. Ava, Gwyneth, and Elsa Heiser won best group costume for their starfish ensembles, and Julia Geith and Eli Ross were recognized for having the most creative use of materials with their jellyfish and beautiful swimmer costumes. Best representation of a plant or animal went to Rhiannon Kilduff for her vampire squid costume. Wells thanks the sponsors of Marine Science Day, who along with faculty, staff, students, and volunteers make the annual event possible. This year’s lead sponsors of Marine Science Day at VIMS were Dominion; the Christopher Wren Association for Lifelong Learning; The Owens Foundation; Bobby’s Auto Service Center, Inc.; Phillips Energy, Inc.; Canon Environmental Technologies, Inc.; Luck Stone Corporation; and John & Julie Dayton. VIMS, one of the leading marine centers in the U.S., provides research, education, and advisory service to help protect and restore Chesapeake Bay and coastal waters worldwide. The Institute offers Master’s and Ph.D. degrees through its School of Marine Science, part of the College of William and Mary. Next up in VIMS 75th anniversary celebration is the June 25th After Hours lecture on “Filming the Giant Squid,” in which ocean explorer Edie Widder describes her unique approach to capturing live footage of this elusive deep-sea predator. Widder, an expert in bioluminescence and founder of the Ocean Research & Conservation Association, has made more than 250 dives in submersibles, with coverage by BBC, PBS, Discovery, and National Geographic. A full list of VIMS' ongoing and upcoming summer outreach events are available on the Public Programs section of the VIMS website.